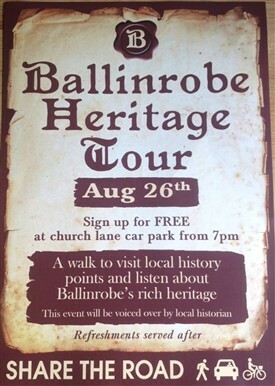 Ballinrobe Heritage walk August 26th. The town of Ballinrobe is the oldest in the county and at one time trading of all sorts were to be found on its busy streets. Throughout the years the town has built up a vast block of history that will be unveiled next Wednesday evening. Join us for a walk around the South and East of our town and listen to one of the most experienced historians in South Mayo.